Screenshot of the instructions for the game. VeggieTales is a Christian 3D-animated children's series made by BigIdea that premiered in 1993. 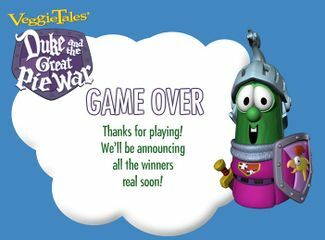 In 2005, BigIdea made an online game called Duke and the Great Pie War, made to promote the VeggieTales episode of the same name. The game was made specifically for a sweepstakes event that ran from February 23 to March 20, 2005, on one of BigIdea's websites PieWar.com. 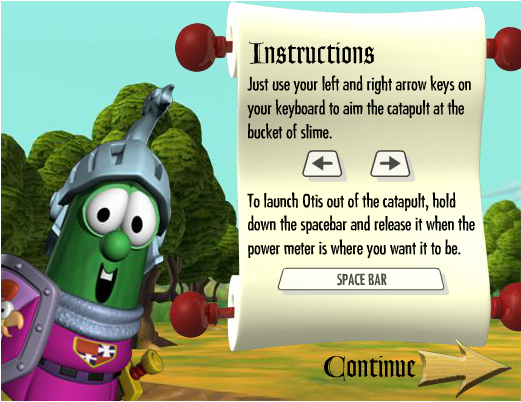 In the sweepstakes, contestants could create an account to play the game, and whoever got the highest score would win VeggieTales prizes. 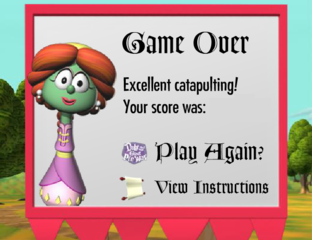 After the sweepstakes were over, the game was moved to Bigideafun.com, where it remained there until the VeggieTales website was revamped in 2011. The game was also on the official Qubo website for some time. All that's known of the gameplay is that it involves launching a character named Otis (Mr. Lunt) into a bucket of slime with a catapult. The player would have to use the left and right arrow keys to adjust the aim of the catapult, and press the space bar to launch him into the bucket of slime. A [broken] .SWF file for the game exists on the Wayback Machine, but it only goes as far as the loading screen, leaving no gameplay. It is currently unknown if there is an .SWF file that has a fixed version of the game. Partial gameplay, showing the broken .SWF file. Advertisement for the game, sourced from the Qubo website. Game over screen for the official web page. Game over screen for the game, sourced from the broken .SWF file. Broken .SWF file for the game. (Remainders of) The official web page for the game. The official web page after the sweepstakes was over. Official rules for the Duke and the Great Pie War Sweepstakes. BigideaFun web page for the game, when the contest was still going. BigIdea web page, containing news about the contest. BigIdeaFun web page for the game, after the contest ended. Official Qubo web page, containing an advertisement for the game.